Cancer that has spread (metastasized) to the brain is normally untreatable because the protective blood-brain barrier blocks entry of most therapeutics. Nanoparticles capable of carrying drugs and "hitchhiking" across the barrier may allow the delivery of life-saving therapies to these tumors. 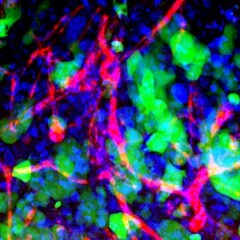 This image shows blood vessels (red), cell nuclei (blue), and human metastatic breast cancer cells (green) in a mouse's brain, after intravenous administration of experimental nanoparticles that can cross the blood-brain barrier.